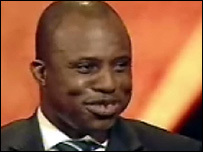 When the toothy, exuberant young man from Ogun State, Mr. Dimeji Bankole, became the Speaker of Nigeria’s House of Representatives following the shameful fall of his predecessor, Ms. Patricia Etteh, one the earliest things he immediately did to purchase for himself some cheap popularity and meretricious acclaim was to state with uncommon unequivocation that the amount actually squandered by former president Olusegun Obasanjo on his phantom power projects was $16 billion and not $10 billion as was widely reported in the nation at that time. Nigerians promptly hailed him for his forthrightness, and went ahead to celebrate him (albeit wrongly) as the quintessence of the very paradigm shift the nation was in such dire need of; indeed, as a symbol of the clear departure from the shameless collaborations and vulgar dissembling that distinguished the rotten era of the horribly corrupt and primitive politics and politicians the nation had become too sick and tired of. Bankole also said or did a couple of other things that gained him one or two commendations here and there; but in the face of the incredibly low descent he has laboured so hard to achieve these past few months, the very few things he appeared to have got right at that initial stage have since disappeared in the chasm of disrepute which now eagerly awaits him and the foul-scented House he happily heads today. His demystification and degeneration commenced and progressed faster than anyone had imagined. The fact that the late Molete politician and “garrison commander,” Lamidi Adedibu, was generous enough to endorse Bankole as a beloved “son” who remembers to pay adequate homage to acclaimed masters of crude, backward and violent politics like himself was early indication the nation needed to prove the eternal truth in the Yoruba proverb that the Butterfly may pretend to be a Bird, but he is not a Bird. Bankole was just too uncomfortable in the borrowed, ill-fitting robes he was draped in when he assumed office, and could not just wait to cast them off to show the nation the real person behind the mask, the kind of political and leadership paradigms that greatly animate him, and the monumental mistake his emergence as Speaker of the House of Representatives was to a nation eager and desperate to achieve a clean slate after sweeping off Etteh and her horde of likeminds. But, again, it has turned out to be another era of monumental disappointment. The only memorable statement I can recall ever hearing from Bankole in the recent past is his most unfortunate charge to his equally unprofitable and bankrupt colleagues to never oppose President Umar Musa Yar’Adua no matter what happens, but to give him unreserved loyalty and wholehearted support to realize the his Seven Point Agenda (whatever that means.) For such a statement, dripping with ill-concealed threats and blackmail, to come from the leadership of a House that is meant to serve as an effective check on the executive is simply tragic. The mere fact that no Member stood up to challenge such a sacrilegious assertion shows the depth of moral and vocational bankruptcy into which the House had sunk. What then is Bankole’s House doing in Abuja if they cannot oppose any action of the president? Shouldn’t they be disbanded to save the nation the resources used in sustaining such a gaggle of purposeless fellows idling away at our expense in Abuja? What really does Nigeria stand to lose if we just abolish our current bicameral legislature and grossly reduce the number of people we are paying to just stay in Abuja and make big fools of themselves on our behalf? Indeed, we must be willing to admit that whatever merits or perceived benefits that may have influenced our choice of two Houses of Assembly have been defeated by the ever ubiquitous Nigerian factor. Time to reduce their number in order to also reduce the endless embarrassments, irritations, disgust and pain they continually cause us. What has Bankole’s House achieved so far except to wallow in one scandal or the other? The story this time is centred on untidy purchase of fleets of exquisite, bullet-proof cars, inflations of prices, accusations and counter-accusations about sleaze and mindless squandering of billions of naira in a nation where 80% of the citizens live below poverty level. In fact, I am too disgusted to want to start recounting the stinking details on this page. From what I have heard so far, some brand of cars were allegedly ordered at a particular price (millions of naira for each); but the ones eventually supplied were selling at a price below the ones initially ordered and paid for. The fear now is that somebody must have pocketed the difference. The explanations by PAN, the suppliers of the cars, sound so incoherent and convoluted that they only fill one with exasperations and frustration. I have no confidence in whatever report that would emerge from the House Ethics Committee, because based on what I have been hearing from the same House probing the same allegations, Bankole and his crowd have already received a clean bill of health. In fact, we should apologise to Etteh for naively helping those who are not better than her to ease her out! Well, we are to blame for expecting too much from such a gaggle of light-minded fellows. This should be a straightforward matter if some people are not there to serve their stomachs only. I don’t care about the motive driving Mr. Festus Keyamo’s campaign for a transparent probe of the whole messy affair. 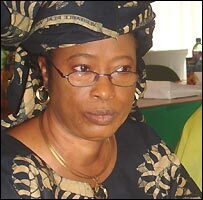 Nor am I moved by the emotional tale making the rounds that a South West governor indicted in the power probe may be instigating the crises in the House to do the Speaker in; as if the power probe report had not already met with its untimely death and received a hurried, indecent burial in Bankole’s House long before the South West governor started planning to unseat him? A colleague whispered to me on Monday that Bankole’s governor may be behind his travails because of their clash over political interests in Ogun State, so, the young man is just a victim of political persecution. For me, all these are mere undiluted bunkum. No matter who is after Bankole’s head, the question is: were there any sharp practices in the purchase of the obscenely costly vehicles? Are these not the same crap they also tried to feed us with when the Etteh scandal broke? In fact, I would want to know why our rulers indulge in such mindless profligacy and lead such lavish lifestyles that seem to suggest they are not aware that more than 80% of Nigerians are living below grinding poverty level. Why should a lawmaker in Nigeria be driving a N6million naira car? The cost of maintaining a public servant in Nigeria (most of whom are painfully unuseful to the nation) must be about the highest in the world? Are we not better of without these fellows? Nigerians have a responsibility to rise with one voice and insist that these lawmakers are too many, too idle, too unproductive and too expensive to maintain, to be yoked on the nation. It is enough to have an executive that takes several months of “thinking, strategising and planning” to make up its mind about the most basic assignments before it; we don’t need this guilt-ridden, servile House that is determined to support the president at any time even if he is leading the nation into a very deep, dark chasm. The Integrity Group (which somebody said during the Etteh saga was inappropriately named) has suddenly lost its voice, because, now it is in power. 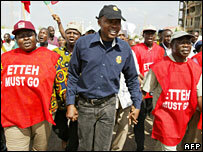 And where is the EFCC? Is there any Immunity Clause on its way now? Would they claim to be unaware that there is widespread demand across the nation for an open and transparent investigation into the matter by an independent body instead of the House Committee on Ethics and Privileges since the House itself has already lost credibility with Nigerians as far this matter is concerned due to the overt partisanship of its members? Well, I can only pity the ordinary Nigerian who can neither afford a roof over his head nor meal in his stomach. And yet his unproductive rulers use N3.2 billion to buy themselves luxury cars, perhaps to impress their mistresses in town. So sad. Next Entry: Mr. President, It’s Too Dark Here!